To get your hands on this mount you need to be Exalted with The August Celestials and then you should be able to buy it. From what ive heard you can buy this for 10.000g but i am not sure yet. A few days ago I confirmed that this mount, Reins of the Thundering Ruby Cloud Serpent, drops off a level 92 rare spawn called Alani the Stormborn who is located flying around the Vale of Eternal Blossoms. My video of the kill can be found here: http://www.youtube.com/watch?v=pLwzUnLKMwo . The mount drop of this rare spawn makes Alani the MoP version of the TLPD/Aeonaxx. Alani has a buff called Nimbus Shroud which makes him immune from being attacked. This buff is removed from an item called Sky Crystal which is created by combining 10x Skyshard. Alani <the Stormborn> is a lvl 92 rare Dragon that is found flying around The Vale of Eternal Blossoms in Pandaria. Alani is MoP's Time-Lost Proto drake/Aeonaxx, but unlike them she is easily found. She does however, have a buff Nimbus Shroud that makes her immune to attack. The buff is removed with a Sky Crystal which is made by combining 10xSkyshard . Once killed she 100% drops the mount Reins of the Thundering Ruby Cloud Serpent. Skyshards have a low drop rate of about 1/1000. They can be found in Treasures of the Vale (from Golden Lotus Dalies),Small Bag of Goods (from rare spawns in the Vale) and looted from most mobs found in the Vale of Eternal Blossoms. There is also a chance to get shards from archaeology within the Vale of Eternal Blossoms. Got the 10 Shards today. Was not all that bad. Collecting them took me about 11 hours added up. Yesterday I started farming them at 3am, for 8 hours. This morning i've gotten the last 2 in 3 hours. Do this at night, there will be much less competition. Also for the rep, farming War-God Dokah is super easy. He spawns about 2 times per hour and has a 78% chance to drop 1 - 4 Stolen Celestial Insignia. Also you can level up Shado-pan, Golden Lotus and Klaxxi too while farming him since he drops Insignias for them too. And don't forget to buy the Grand Commendation of the August Celestials once you hit Revered. It will double the rep you get, with Mr. Popularity it will be (once you are Revered) 2.2k rep for each Insignia. From patch 6.2.2 on, the Reins of the Thundering Ruby Cloud Serpent no longer has a reputation requirement with The August Celestials to learn. it's not because its hard to farm the Skyshard but extreme time consuming or it was for me. For those of you curious why so many Sky Crystal farming groups or people selling Alani kills showing in the group finder here is why. 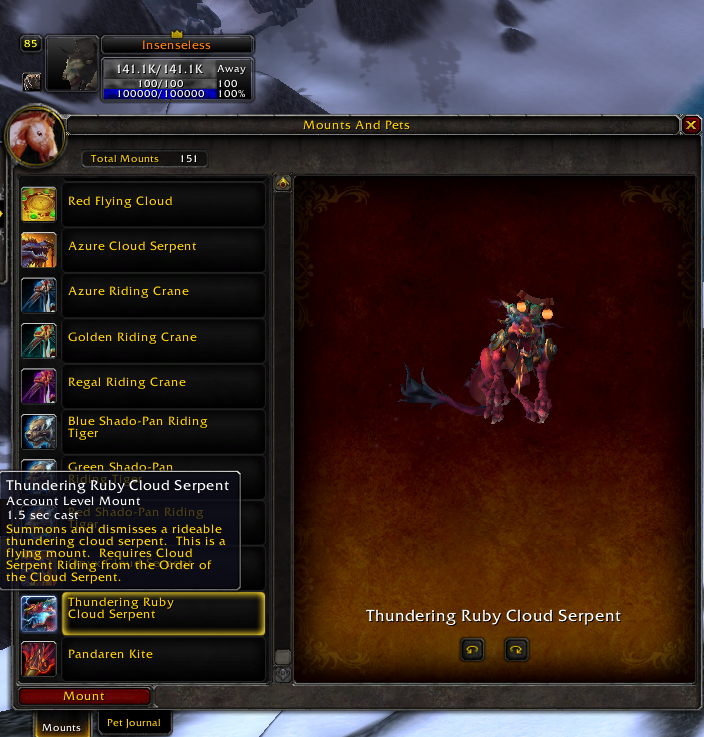 As of patch 7.0.3 the drop for Reins of the Thundering Ruby Cloud Serpent is now shared drop between party members. This means that you can farm Sky Crystal in a group. Funnel the drops to a single player then kill Alani much quicker than doing it solo. Or if you have collected the prerequisite 10 Sky Crystal you can sell the party slots and still collect the mount for yourself. Looted today by everyone in my 4-man party. I had the Sky Crystal and activated it (did not attack Alani with any other abilities) and my three friends (one of which did not even tag Alani with abilities either) were in a group with me. All of us got the mount, despite 2 of us not tagging with abilities. I've seen others confirm elsewhere that the person with the Sky Crystal is 100% guaranteed a "tag" on Alani for the mount, and at least 1 other person in the group must tag in order to "unlock it for everyone." I'd be inclined to agree with this based on our experience, but another thing to point out is that 3 out of 4 of us had stripped down to our skivvies in order to "ensure" that everyone got to hit Alani without killing her for a tag. (Even though that didn't quite work out as planned...) She did however live for a good 5-10sec as opposed to being immediately nuked. Now, I'm only speculating here, but maybe people are having trouble getting the shared loot because Alani is dying too quickly and it bugs out? Just something to consider. I farmed for about 90 minutes to test my luck on getting some Skyshard. I got none. Saw that one of these was going on my AH for 60k and bought it. If you can find one on your AH for a price like that and you have the gold, buy it. You can easily farm twice that amount of gold in the same time it seems to take for the amount of Skyshard to drop. "From their infancy, Thundering Cloud Serpents are drawn to storms. They have been known to chase lightning through the blackened, roiling clouds, and to bathe in the pouring rain."